The Real Canadian Hockeystick | Watts Up With That? Since 2008, per capita gasoline use in BC has declined by 7.3% more than in the rest of Canada (Table 4) – a substantial difference. Gasoline use in BC was already declining faster than in the rest of Canada from 2000-2007 (see Figure 4). Well, that’s pretty amazing, not only has “gasoline use in BC” leveled off, it’s been declining. You expect the clouds to part and celestial trumpets to ring out for those kinds of results. … And for those folks like myself who are reluctant to believe in miracles, for those unabashed cynics who wonder how BC is making such deep cuts in gasoline use, consider Figure 1. So what does Figure 1 show? 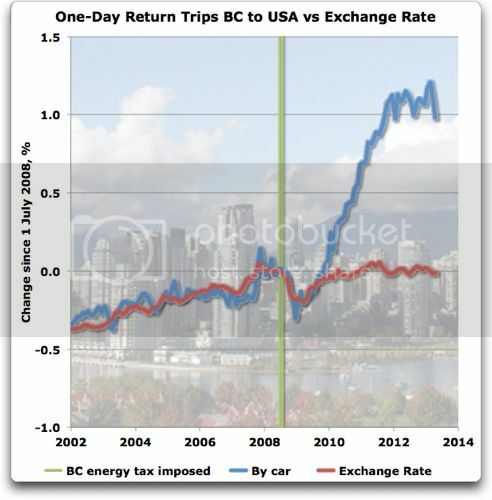 Noble Canadian consumers are buying ever-increasing amounts of gasoline in the US of A, because there’s no carbon tax in Washington State. Patriotism at its finest. And you see how trips by bus and foot and train dropped when the automobile trips increased? So many folks are going from Canada to the US in automobiles that they’re taking their friends with them, plus folks who used to take the bus (or walk) across the border are now taking cars in order to bring back gas. It’s worth it to drive now, because you can bring back a tank full of gasoline with no energy tax. And how much effect is this entirely predictable human behavior having on the miraculous reduction in BC gas usage? Well, therein lies a tale. Figure 2. Changes in total BC gasoline sales for highway use (motor gasoline). Blue line shows the trend from 1993-2007, extended out to 2014. Red line shows the actual data. Emissions from BC motor gasoline have been rising steadily since as far back as Statistics Canada has numbers, 1993, right up to 2007 … which brings me to the second oddity. This is that the tax hasn’t impacted total BC motor gasoline sales in the slightest—they’re right back up the pre-tax trend line. To be sure, during that time the population went up more than the fuel sales … but that’s immaterial regarding total emissions, and if you believe the IPCC, total emissions are all that counts. Leaving aside trips in excess of two nights for now, we estimate that, in 2012, same-day crossings and overnight U.S. trips of two days or less together amounted to spending by B.C. residents of $1.0 billion to $1.6 billion. This estimate is based on the assumption that almost all (95 per cent) same-day and overnight vehicle crossings involve the purchase of gas, and that the average gasoline purchase was CN$70 last year. As with total retail spending, per capita sales at B.C. gas stations have gone from exceeding the national average to being well below it within a couple of years. While the carbon tax and Translink-related fuel levies may have prompted some B.C. vehicle owners to drive less, the steep increase in cross-border trips and shopping leads us to conclude that a good portion of the reduction in gasoline sales in the lower mainland especially reflects rising cross-border gas purchases rather than meaningful underlying changes in consumer behaviour. Per capita gas sales in B.C. are now $90 below the Canadian level. As recently as 2009 they were $95 above the Canada-wide average. Add me to the list. I buy enough fuel at the Alberta border with BC to get me to my BC destination. Then if I am near the US border like at Grand Forks, I slip across the border like everyone else and fill up for the return trip. The US Danville station there is just a few hundred metres across the border. Figure 3. Highway gasoline sales in BC, plus purchases made in the USA. As you can see, the net effect of the BC energy tax on highway gasoline sales has been a fairly significant rise in CO2 emissions … heck of a plan they’ve got there. Note also that as far as I know they don’t account for the “leakage” of gasoline over the border when making their overblown claims about CO2 reduction … surprising, I know. So for those claiming that BC is a shining example that we should all follow? Sorry, but the claim has always been that we need to reduce total emissions, and regarding the CO2 emissions of motor gasoline in British Columbia, they’re increasing, not going down. Never get to three-thousands of a degree of cooling that way, no sirree. On that first graph, why are one percent and negative-one percent each listed twice? Kinda confusing. “Think local, act stupid” should be the green motto in a global economy. Hey, fair’s fair! During Prohibition, yanks bootlegged Canadian booze into the US. Now we return the favor, and let Canadians bootleg US gasoline into Canada. I wonder how much of the gas is made from Canadian oil? Oh, those fuelish BC politicians. ‘California dreaming’ has come to British Columbia. Stupidity is a political do-gooder who tries to force others to do their will. It is funny that it is only when it is not for your ‘own good’ that it is called tyranny. Willis: My first thought is that a rising Canadian $ contributed to those cross border visits. I would have been wrong. 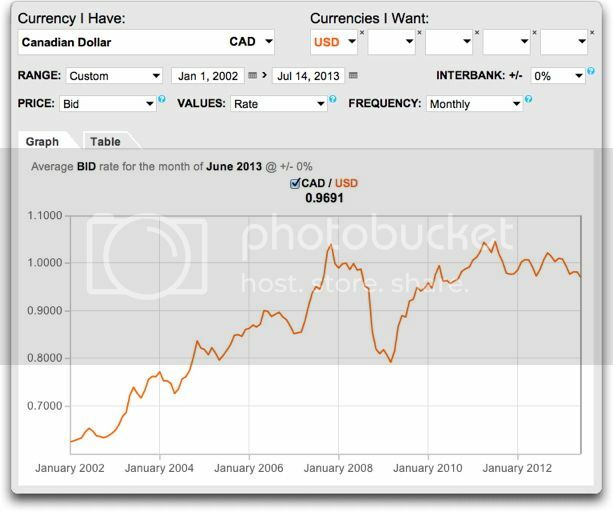 The CAD lost about 40% of its value against the USD, 2007-2009. For my American friends across the border, let me emphasize that: It was cheaper to buy fuel in the US (and other goods), than in BC, in spite of a 40% differential in currency. Add me to the list of people living in B.C. who purchase gas in the province less than once every couple months. The weekly fill-up is in Blaine. Pick the right time on the right morning and there is no wait at the U.S. customs (8 lines open) with a much longer wait coming back into Canada (2 booths open, the other 10 or 12 CBSA agents chatting and drinking coffee in the office). Most of the difference in pricing though comes from the Transit Tax, not the Carbon Tax. The regional transit board has clearly never heard of the Laffer Curve, because they keep increasing tax on gasoline and are totally confused when the revenue generated doesn’t rise linearly with the tax increase. Another outrageous feature of the Carbon Tax is that it is based on a price of $25 per ton for carbon offsets. If they used a market price (somewhere between 10 cents and $3) it would be annoying, but not crippling. 2. Each year more and more efficient cars are hitting the highway bought by higher income earners. So it would appear per capita use among wealthier British Columbians is actually skyrocketing. So not only are they taking the same amount of trips they are also traveling farther to fill up, so they’re carbon contribution has actually gone up! Some one in BC please send this on to the Vancouver papers and TV. Having remodeled a house in BC with a ton of US items, I can tell you it is mostly in the exchange rate. For the shaft of your hockey stick, a CAD was about .82 USD. They changed to 1 to 1, and the buying frenzy began, forming the blade. They told me at the border that imports of US purchased cars went from 2-3 a day to 50-60 a day. Willis, your first graph is what being sceptical is all about. When people talk of electric cars you have to ask about how the electricity is produced etc. I forgot to also mention that the top graph should act as a general warning to Warmists. People are not all pig stupid. You stop the developing world from building coal or oil powered stations and they will cut every tree they need to for cooking and heat. It is as simple as that. 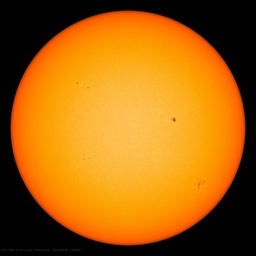 How much has that dented co2 in our atmosphere? Greens seem to think there are (currently) easy solutions for our energy issues. The question Warmists have to answer honestly is this: What would you do if you owned a car near the US / BC border? The article made mention that BC GHG emissions were down while Canada’s were up. I looked in Stats Can for any GHG emission charts and found none. Even if there are numbers they would be calculated, (as I am quite sure there is no monitor in each province that only monitors the air coming from the province) and since BC has no idea how much gasoline is burned in the province they would be wrong. About the Patriotism. It is not unpatriotic to ignore a government’s attempt at removing all the money from your wallet. Especially when the government was not mandated by the people to pass that legislation. 30 years ago the Canucks would jam the bridge at Niagra Falls bringing beer and going back with gasoline and cigarettes. Transit funding in BC is another great story of government courage. /sarc off. How can this be put out to the Canadian MSM? 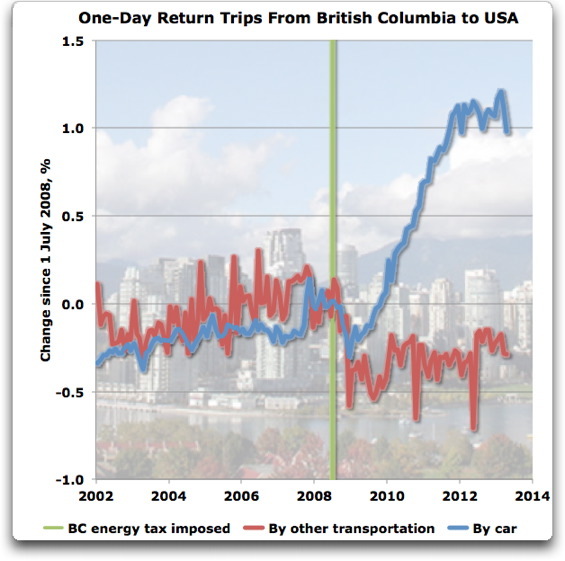 With numbers mentioned in the article, I see that BC’s tax got people to drive a little less (or use more fuel-efficient cars) and use a little less gas overall, but greatly increase their usage of gas sold outside BC. As said, per capita consumption has been on a more downward trend than in the rest of Canada since 2000, but gasoline usage increased due to population growth. of pre-2008-tax sales not an effect of the tax if per-capita consumption, including out-of-BC purchases, is continuing to decrease. I suspect more likely, the linear trend of a dataset ending in 2007 is not sufficiently reflecting whatever caused the 2009-2011 uptick. And a 2-2.5% increase in short duration car trips to USA (Figure 1) does not appear to me to explain a ~5% increase in gasoline consumption (dark blue line compared to linear trend in right side of Figure 3). Perhaps BC gained industry from nearby USA due to healthcare coverage being less of a problem of employers in Canada than in USA, while healthcare coverage inflation has been huge. I have seen this happening in Ontario – especially in Mississauga. Not that I think the energy tax was very effective at reducing gasoline consumption, or that I think manmade global warming is as big a problem as claimed by most advocates of its existence. 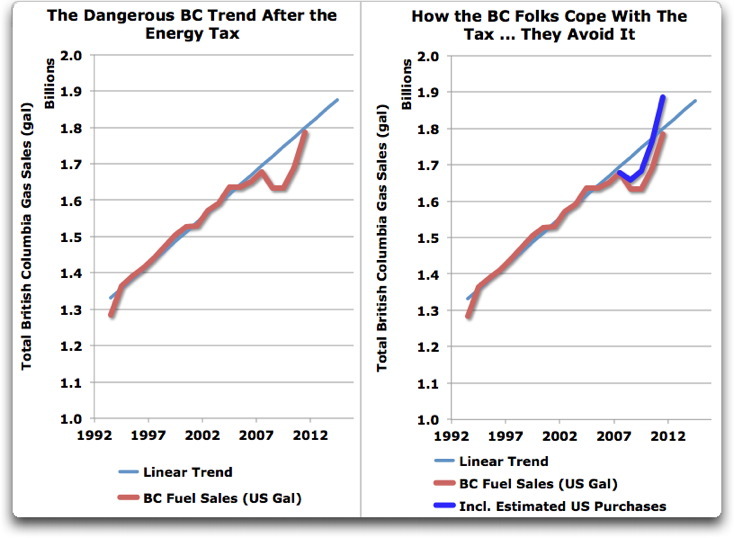 But, I have doubts of the “net effect of the BC energy tax”, as in gasoline consumption with the tax *in comparison to gasoline consumption without the tax*, is increase of gasoline consumption. The BC carbon tax is just another wallet-grabbing exercise. Regular gasoline is selling for $1.51 per liter, in Vancouver. I just filled up at Costco, in Burlington WA, for $3.939 per gallon. Believe it or not, I’m a fan, but that statement leaves me cold. If we were to concede that CO2 emission is a bad thing, then reducing per capita emissions is a good thing; total emissions may still be increasing (but not necessarily, about which more anon), but less than they otherwise would. Additionally, if BC population is increasing at other provinces’ (or any other nations’) expense, then that increase in low-per-capita-emission-region population at the expense of higher-per-capita-emssion-region population can conceivably mean that total emissions are decreasing as a result. I recognize that he thereafter explains that even the per-capita reduction may be illusory; I’m just saying that the quoted passage is a logical flaw. Adam Smith is laughing. The “unintended consequences of stupidity” strike yet again. Not that I think manmade global warming (which I see as existing) is quite enough of a problem that it requires solutions that significantly hamper economic growth. For one thing, more economic growth increases human ability to deal with a planetary disaster decades or more in the future, and that may be something other than global warming. More important reasons to motivate reduced fuel consumption are to make the fossil fuel supply last longer, and to reduce 1st-world nations being dependent on 3rd-world nations that hate them except as fossil fuel customers. Any tax for such purpose needs to be broad-based in what it covers, and focused on what is less-energy-efficient than it can be (or otherwise wasteful). The most senior Democrat and the most senior Republican in the respective Senate and House committees relevant to energy and to commerce. 2 other appointers are the highest ranking House member and the highest ranking Senate member of the House-Senate Conference Committee. The remaining 2 are the Secretaries of Commerce and of Energy. I would further propose that legislation authorizing such a “Blue Ribbon Committee” has a clause to allow it to refuse recommendations, on basis of excessive political polarization. Also, I would want auhorizing legislation to prohibit gifts (as presumably by biased parties), as needing to be reported to IRS. close a bunch of military bases, mostly pork-barrel ones but a few were in or near leftish big cities, such as one that wanted to ban nuclear weapons from its naval yard. Good way to get government employment reduced! little government needs to motivate energy conservation – both in whole, and carbon-based. This would be via proposed *very specific* legislations and regulations. agree on anything by a required ratio – I prefer 60/40. My wife is from Vancouver and and shopping trips across the border into the USA have long been popular, to take advantage of lower prices. In large part, due to lower US taxes. So, not only is BC losing revenues from more people buying gas in the USA, it will also be losing revenues from more purchases of other goods in the USA. I think you can probably find a correlation between added highway miles and reduced fuel consumption in Vancouver. What used to take hours of bumping along in VBC street level traffic is now a breeze with the new freeway/turnpike roads. The hell of it is it is still a major PITA to cross the border in either direction unless you cross at Nighthawk or Osoyoos lake. BTW, what ever happened to the great BC scheme to create hydrogen highways? Google it – there’s quite a greensworld fantasy wound around that. I find this story very uplifting, celebrating as it does the triumph of bloody-minded human ingenuity over ideological oppression. Well done you Canucks! Yep, that’s what a tax does. In international media Finland has been used as an example of how a tax on alcohol reduces alcohol sales and therefore also consumption. Unfortunately there is a catch. We are surrounded by countries that have much lower alcohol taxes than us – Estonia, Russia and Sweden. And then there are cruise ships sailing back and forth the baltic sea, just so that the passengers can buy tax-free booze. A bottle of irish or belgian beer costs currently over 1€ less in Sweden than in Finland, and the price is even lower in Estonia and Russia. When the tax goes down, importing becomes less worth the hassle. When the tax goes up, it starts to pay again. Our moron leaders think they are actually adjusting the consumption, when all they are doing is making people hoard alcohol from abroad. And having large storages of alcohol isn’t really an incentive to quit drinking. Well, yes, you can tell me that “it is mostly in the exchange rate”. However, I prefer real data to anecdote, and here’s why. The exchange rate grew slowly and steadily from 60% to 100% from January 2002 until December 2007. This means that as the Canadian dollar strengthened, , slid downwards to January 2009, and then rose again to the end-2007 level. For the shaft of your hockey stick, a CAD was about .82 USD. They changed to 1 to 1, and the buying frenzy began, forming the blade. There was no sudden change to an exchange rate of 1 to 1. And after peaking at to 1 to 1 at the end of 2007, it started sliding again, slid back down to $0.80 CDN to 1 US$, turned around, and one year later it was back at 1 to 1. Willis, you nailed it…..just like you usually do. Thanks again. Thanks, Joe, I’m a fan of yours as well. Sorry for the lack of clarity. My point was that the assumption that the British Utopians could cool the earth by 0.003°C is based on their freezing of total emissions at 2008 levels. So when they don’t do that, it cuts into even that tiny theoretically possible gain. while it may not be a hockey stick ..the people of BC are definitely get a shaft. it also increases the carbon “tire” foot print as it increases the miles because of increased driving to get fuel. still it isn’t fair what Willis is doing here. he is using a brain against self lobotomized progs. But how about “declining faster than in the rest of Canada from 2000-2007”, Willis? strawman in light of the actual quote. Vancouver gas price includes 15c (?) transit tax not “enjoyed” by the rest of BC. Did someone point out that it was meanie-Greenie Andrew Weaver who whispered in Gordon Campbell’s ear to inspire the Carbon Tax? Since on average it’s certain to be further to drive to get to the US/Alberta gas pump than the neighborhood one, the tax has necessarily increased driving and hence usage. But since CO2 is a benefit, it’s all good! What about the transfer of other economic activity, not just gas sales ? Given the disparity between domestic electricity and gasoline prices, especially if greentard governments are rampaging around imposing carbon taxes on fuel, at what point does it become worth having your own backyard CTL plant, for producing gasoline for your car? In summary, if a local government raises taxes on goods that can be purchased outside their tax jurisdiction consumers will purchase the goods elsewhere.Check New York cigarette tax for further proof. Unlike gasoline, cigarettes can be bootlegged so the honest merchants suffer a revenue loss well. Human behavior is pretty predictable for those that care to observe.Socialist are exempted. Quite true Willis, Those numbers are firm in my memory because I bought that house when the CAD was .82 and sold it at 1.00. Thanks for doing the homework. There are no acceptable political parties in BC. Every one of the parties we have here will cause serious problems if elected. For the frustrated BC electorate, the lesser of evils ends up being a parasite because people deeply fear the other option is a predator that will kill the economy. People aren’t voting for the crap they get. They’ve voting against something they deeply fear will be far worse. Moving forward we need to find a way to create viable, sensible alternatives. This is a formidable challenge. Help from outside BC might be welcome. These are the open borders that everyone can love. Adam Smith would be proud. For what it is worth I moved west to Alberta in 1980 and skied in BC regularly every year even buying a condo in Fernie BC in 1996 which I still own and visit regularly. Gasoline in BC was always a little pricier than on the Alberta side but the few cents a litre was more nuisance and something we would comment on regarding BC’s higher gas taxes and a provincial sales tax making BC’s cost of living higher. However with the price increase in 2008 the much higher gasoline prices stuck out like dog balls and that was the end of my purchases of gasoline in BC. If road conditions are suspect I fill up at the border before crossing into the “high price area” … if I drive a lot in BC I try to make it back out to Alberta to fill the tank. Everyone I know does the same and no BC person would not fill up before returning from the US or Alberta. The carbon tax has changed behaviour but not necessarily the way the loons of the left think it has. For me it seems that a few cents a litre price difference wasn’t an issue but once it was pricier by 10 to 15 cents a litre or $10 dearer to fill up in BC then my behaviour (and all family and friends) changed dramatically since at ten dollars you seem to hit that level of significance that matters. I’m posting comments through my smart phone. I originally wrote that the Burlington Costco was selling gas for $3.939/gal. That’s right! Even a bigger price difference. 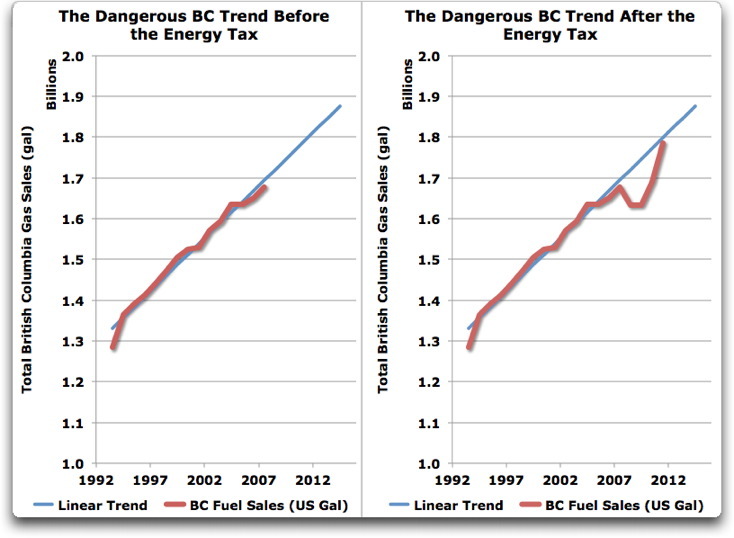 Sorry to contradict Willis’ excellent analysis, but the BC carbon tax is 100% effective. The only purpose of a tax is for the government to steal your money. Looks like the market works, I just wonder what it makes with the canadian revenue figures. Last year when Crispy Clark came round looking for votes here in SE BC my wife ask her “why have a carbon tax when hurts the economy and unfairly taxes rural BC for going to work. Clark answered “It’s simple, this money goes to general revenue and we can’t do without it.” Kindof a catch 22 because a lot of that money is now going to the states.Oops! It seems everyone has forgotten that provincial income tax rates were reduced when the carbon tax was imposed. For almost everybody, and the government too, the trade of one for the other is close to a wash.
“heck of a plan they’ve got there”. Any planning against the market’s natural forces requires real communist forcing to implant. And these plans always hurt the people, starting with the poorest. The glaring exception to “almost everybody” is those who pay little or no income tax, i.e. the poor. They can’t, however, avoid paying the extras that are tacked on to the cost of almost everything because of a CO2 tax. Also, as posters have noted, the locals are now spending their money over the border (and not just on fuel) which adversely affects local business and – shock, horror – local tax revenue. I bet the provincial government would ban cross-border shopping if they could. This sort of increase in tax would work in New Zealand. Not as if we can drive to Australia to get cheaper fuel! Shows Green Canadians are as thick as Greens elsewhere though. To start with, the tax is not a wash, because it attracts Federal GST, and so you have to pay taxes on the taxes, and you never get that back. It’s also not a wash, because the people doing the spending are not the people getting the refunds. It’s not a wash because even if the right people get the money, they don’t get money back in proportion to what they spent. It’s not a wash because millions and millions of people are going across the border, buying untaxed energy, and then receiving refunds on what they haven’t spent. It’s not a wash because (as I pointed out elsewhere), when I was 17 I was living on my own and working at a job … and if I’d done that in BC, I’d have been paying energy tax and not getting a damn cent back. So despite paying the tax like everyone else, you can’t get money back until you’re 19 … go figure. It’s not a wash because of the expenses of the government in administering and overseeing the taxes are paid out of your pocket. It’s not a wash because the suckers in BC will be paying pensions for the pluted bloatocrats for decades … and the energy tax doesn’t even cover their present costs, much less their future costs. So no, it’s nowhere near “close to a wash”, that’s close to hogwash … I’m writing a post on this topic, and I hope it’s my last, I want to get back to real science. Thanks for your time and effort Willis. Appreciated! All Canadians know that when you visit BC it means “bring cash”. I drove Calgary to Spokane and back this week. Filled in Alberta, traversed BC. On the way back, filled Idaho, traversed BC. AB CAD$1.2 / litre. BC CAD$1.38 / litre. Idaho USD$3.65 / US gal (about CAD$1.02 / litre). Why did I not buy in BC? Here’s another factor: Look at your exchange rate vs trip graph—- the first blip of increase was indeed part of a shopping frenzy brought on by the 1:1 exchange rate. Problem was, there were two hour waits at the boarder, so that increase was unsustainable (and, might I add, left lots of vehicles idle, cranking out extra CO2). The busiest crossing by far is the Peace Arch on I-5. It was expanded from three lanes to ten, making it practical for far greater traffic flow when the CAD bounced back to parity. That helped the blade of your graph to grow and grow. SURREY (NEWS1130) – Some major improvements to the Peace Arch border are near completion. Soon heading into the States will now be more efficient and provide better safety. This weekend the US Border Patrol began their transition into a new high tech security building. While the move will be gradual, the Service Port for Blaine aims to tear down the old building within the week. So what can you expect now that the buildings are switched. Mike Milne with the Port says by the time construction is done in the fall there will be up to ten lanes southbound that could be open at any given time. Currently there are only three lanes to get you into the states. One of the more impressive security features includes having every lane equipped for Nexus use. appropriate people have been bought . For those who don’t know, a Nexus Pass essentially provides pre-screening for border crossing, in most cases completely eliminating the need to even stop at the border. Typical reader comment: It may not have hurt the economy, but it does hurt individuals. Unfortunately, Plumer’s coverage of BC’s carbon tax was incomplete, and it only considered a problematic report from a pro-carbon tax group in Ottawa, Canada, entitled Sustainable Prosperity. In a follow-up study, my colleague and I looked in detail at the positive claims made by Sustainable Prosperity regarding BC’s carbon tax, and we were unable to reproduce them.